Oh my, we have a super duper LOVELY Cloutdown Clock Prinable for you! 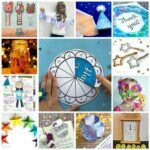 This was created in partnership with the lovely Hattifant (who has a beautiful Mandala Countdown Clock version for you too). 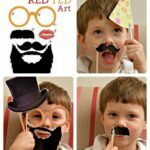 We love New Year’s Eve and New Year’s Eve celebrations for kids. 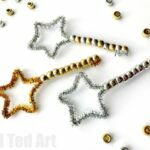 So this year, we go together to bring you a fabulous set of New Year’s Eve Activities for kids.. keep them busy during those fun, but oh so loooong hours counting down to the New Year. 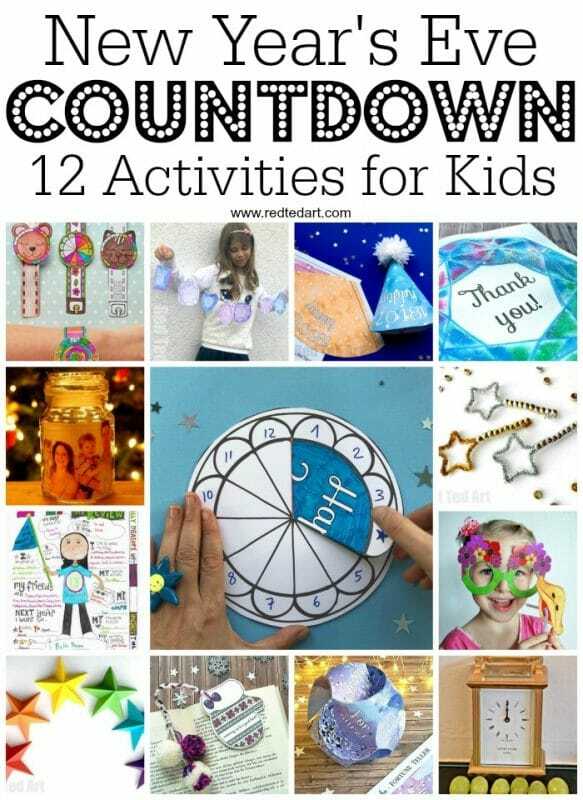 And we are quite aware, that the grown ups may like a little glass of bubbly or two.. so we have broght together what we hope is a wonderful set of Coutdown Activities to keep you all happy. 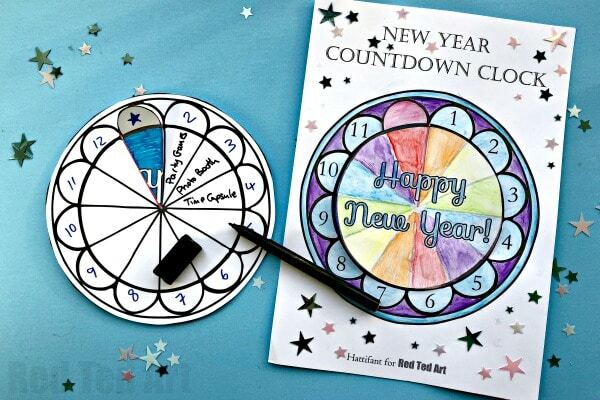 Kicking things off, is this fabulous Countdown Clock Printable for New Year’s Eve! 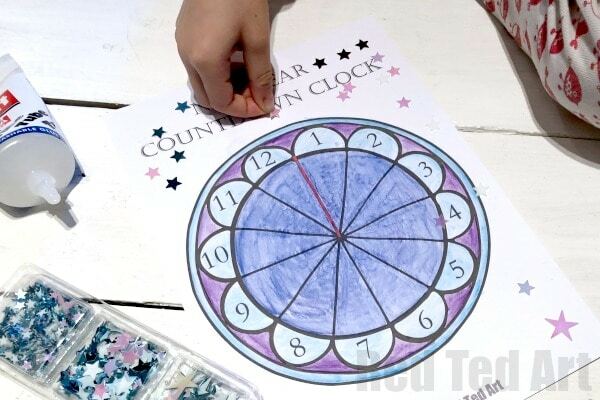 Check out our New Year’s Eve Count Down Activity posts for kids – add each activity to your clock face below! 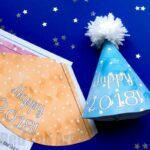 Combine these with our fun New Year’s Eve Activities Round Up or New Year’s Eve Traditions and get New Year’s Eve sorted.. 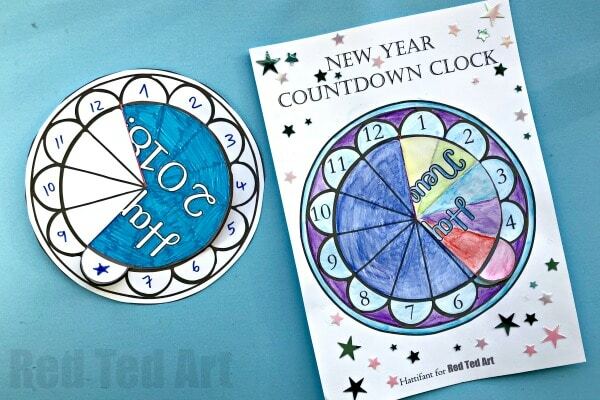 These Countdown Clocks for New Year’s are super easy to make and so fun. 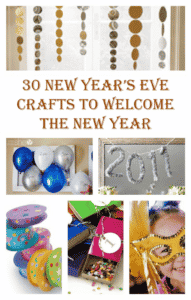 We have created two types – one counting down from mid day – with hourly New Year’s Eve activities and ideas.. the other a “blank” version – so you can add you own 12 unit count down – start at say 6pm and go down in half hours – 6:30pm, 7pm, 7:30pm etc…. THE CLOCK HAS BEEN UPDATED TO 2019! 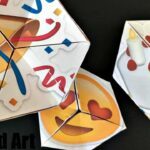 First published ands hared in 2017 – updated for your convenience! 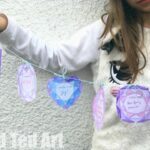 Confettit to decorate (optional!!) 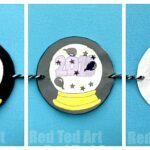 – we used some confetti stars..
Watch our handy countdown clock video and you will see how quick and easy it is to make this clock!! Or follow the step by step instructions below! 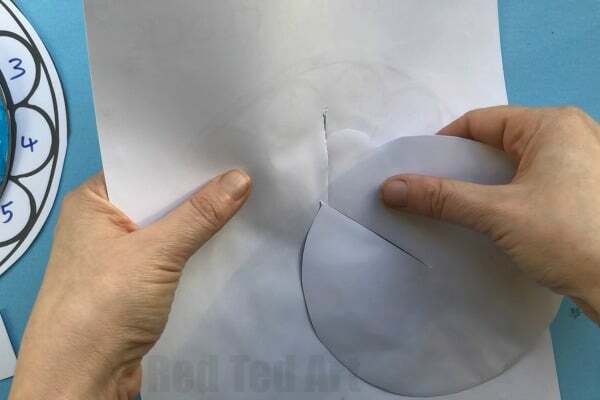 Remember you have two choice – make a “round clock” or leave the main clock in your A4 sheet of paper and decorate around it. I think both are lovely in different ways. 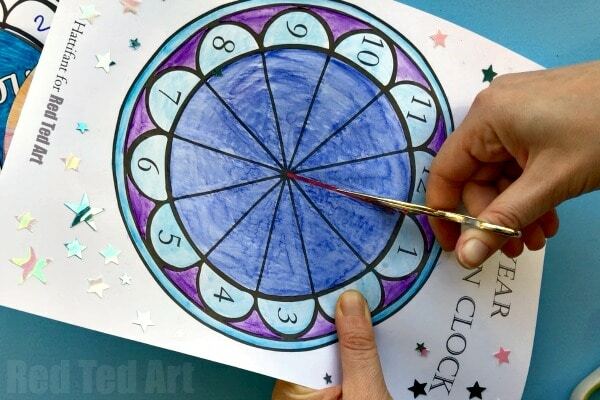 Begin by colouring your different clock parts – the little rectangle, can be left blank as it forms part of the mechanism to secure the clock at the back. 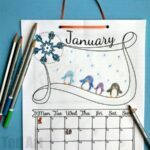 Remember you can decorate your whole cover sheet or just the clock itself. Your choice. 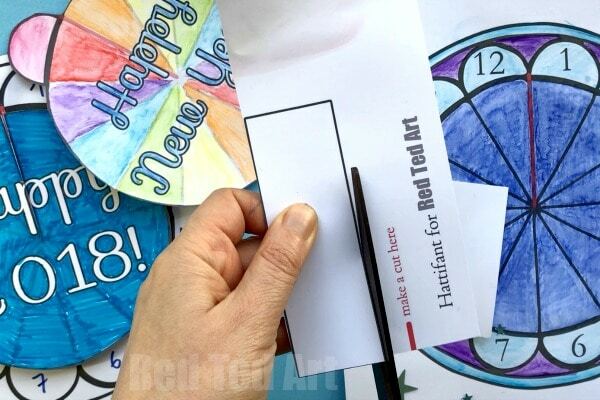 Cut our your sheet two – so the “Happy New Year” dial and the rectangle. If you wish cut out the main face too (but not necessary). 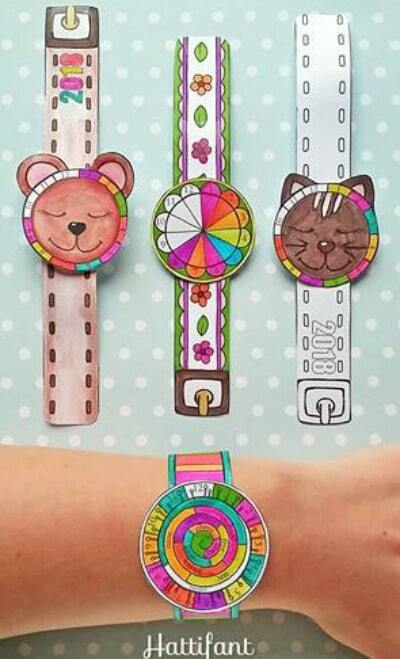 Cut along the red line in both your Countdown Clock Face and the New Year’s dial. Slote the New Year’s Dial INTO the Countdown Clock Face. 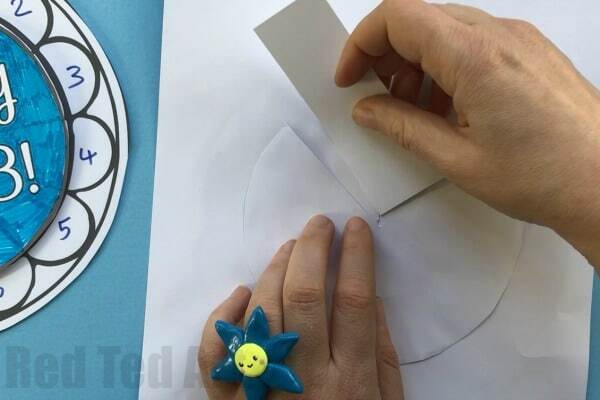 Then align the rectangle with the “end of your dial” and tape in place. This will prevent your dial from slipping out. Finished. Yep.. it really is that easy. 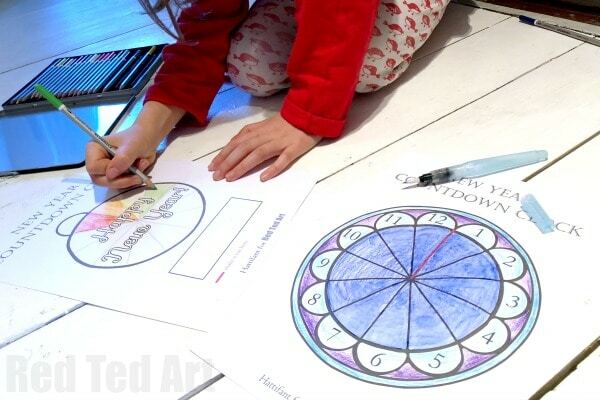 Over 12 activity ideas, with a choice of printables for almost each activity! 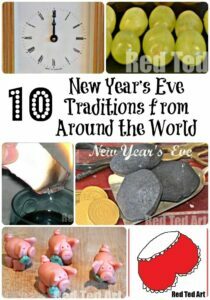 Or why not have a giggle and learn all about New Year’s Eve traditions from around the world?